In medium saucepan, combine wild rice, onion and water. Bring to a boil. Reduce heat to low; cover and simmer about 50 to 60 minutes or until rice is tender and water is absorbed. Set aside. Melt margarine in medium saucepan over medium heat. Stir in flour, 1/4 teaspoon salt and pepper. Cook until mixture is smooth and bubbly, stirring constantly. Gradually stir in broth and milk, cooking until mixture boils and thickens, stirring constantly. Remove from heat. Heat oven to 350°F. 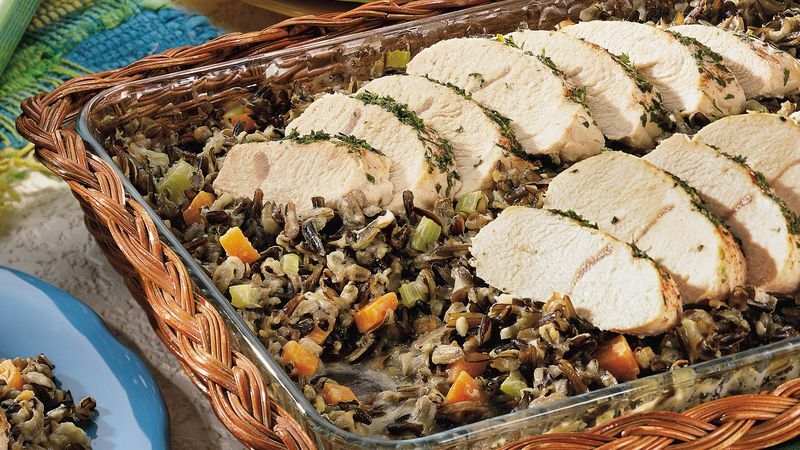 In ungreased 12x8-inch (2-quart) glass baking dish, combine cooked rice mixture and sauce, carrot, celery and sage; mix well. Place turkey breast tenderloins over rice. Sprinkle with 1/4 teaspoon salt, parsley and paprika. Cover with foil. Bake at 350°F. for 1 to 1 1/4 hours or until turkey is no longer pink. To serve, cut turkey breast tenderloins crosswise into 1/2-inch-thick slices. Sage is the traditional seasoning for the Thanksgiving turkey as well as any number of poultry dishes. The fresh herb can be readily identified by its velvety, gray-green leaves, which are aromatic and whose flavor intensifies when the herb is dried. Two forms of dried sage are available in the supermarket. Rubbed sage is subjected to minimal grinding and is fluffy. It should be crushed slightly when used in a recipe. Ground sage has been finely ground to a powder and is ready to use. Because the flavor of ground sage is highly concentrated, the amount needed for recipes is reduced.